Academic year 2019-20 in which he/she is seeking admission. Admission Schedule for Admission into VI class and for vacant seats in VII to X for the Academic Year 2019-20. • Submission of wrong online information will lead to cancellation of admission without any notice. • Caste and Date of Birth Certificates should be submitted to the Principal at the time of admission. Students of Erstwhile Mandal by virtue of domicile (Nativity) where the Model School is located or who have studied one of the two previous classes in Government / Recognized School in the Mandal where the Model School is located are to be considered as eligible for Admission Test. 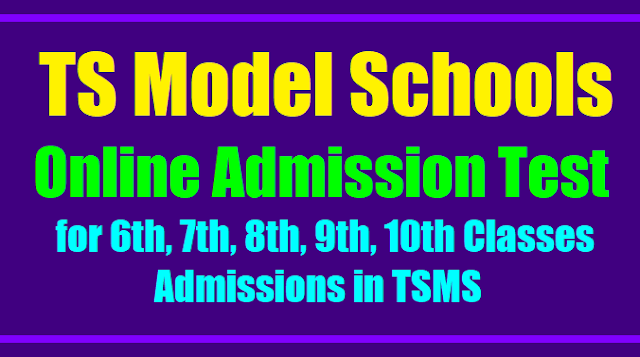 It is decided to conduct online test for Admission into VI Class in TS Model Schools and for left over seats as on date of Admission for classes VII to X for the academic year 2019-19. The date of Examination will be intimated later( TS Model Schools Entrance Test Date: 13-04-2019).